This month SIPRI and its partners launched Mistra Geopolitics, a large-scale, interdisciplinary programme examining the impact of climate and environmental change on today’s geopolitical landscape. SIPRI and the Geneva International Centre for Humanitarian Demining (GICHD) have released a new global report of anti-vehicle mine incidents in 2016. The report finds 181 incidents related, or suspected to be related, to anti-vehicle mines in 22 states and territories in 2016. SIPRI is pleased to make the Chinese translations of SIPRI Yearbook editions 2011 to 2015 available online. 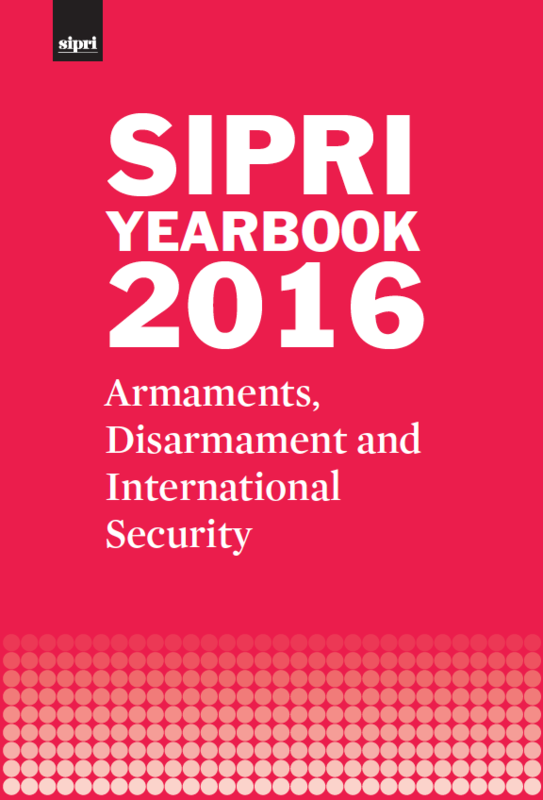 The SIPRI Yearbook provides an overview of developments in international security, military expenditure, the arms trade and arms production, and armed conflicts, along with efforts to control conventional, nuclear, chemical and biological weapons. The third annual Life in Kyrgyzstan Conference will take place in Bishkek on 12–13 October 2017. SIPRI, as one of the organizers of the conference, welcomes proposals for individual research papers and entire sessions on the topic of socio-economic development in Central Asia. SIPRI welcomed representatives from the Hiroshima Prefectural Government, led by Governor Hidehiko Yuzaki, during a visit earlier this month. The two parties signed a Memorandum of Understanding regarding future work towards nuclear disarmament. SIPRI is pleased to announce the production of three new episodes of the series Peace Points. In these episodes, SIPRI Director Dan Smith discusses the 2017 Stockholm Forum on Peace and Development, the new cooperation agreement between SIPRI and the Hiroshima Prefecture, and the recent global cyber attacks. Climate change has accelerated the melting of the Arctic ice, making the region's oil and gas reserves more accessible. This backgrounder looks at the status of Chinese–Russian energy cooperation in the Arctic. Dr Lars-Erik Lundin looks back at the role of dialogue in resolving past European security challenges and argues that a similar approach is needed today. SIPRI and the Swedish Ministry for Foreign Affairs hosted the 2017 Stockholm Forum on Peace and Development with the theme of ‘Sustaining Peace: What Works?’. The 2017 Stockholm Forum brought together over 200 policymakers and practitioners from around the world to identify good practice in peacebuilding interventions and assess how such approaches might be modified to meet the needs of other contexts. As preparations commence in Vienna for the 2020 Review Conference of the 1968 Treaty on the Non-Proliferation of Nuclear Weapons (NPT), differences between the non-nuclear weapon states parties (NNWS) and the nuclear-weapon states (NWS) on the pace and extent of nuclear disarmament are widening. This paper discusses two possible ways to bridge these differences: (a) review the roles and responsibilities of states possessing nuclear weapons and non-nuclear weapon states; and (b) consider transparency measures concerning nuclear weapons that contribute to preventing detonations by accident or in war and facilitating disarmament. The EU should undertake a new and dedicated effort to deal with the problems related to weapons of mass destruction (WMD). More specifically, one or more new strategy documents are required and, in this context, the EU should also pursue WMD-related contingency planning to increase preparedness and prevent or counter crises. If the EU does not undertake these efforts, something much more will be at stake than the effectiveness of EU programmes in the areas of non-proliferation, arms control and disarmament. This report from SIPRI and the Geneva International Centre for Humanitarian Demining (GICHD) presents and analyses anti-vehicle mine (AVM) incident data from 2016. It finds 181 incidents in 2016 that were related or suspected to be related to AVMs in 22 states and territories. This represents a minor increase compared to 2015, when 178 incidents were recorded in 25 states and territories. Declining defence budgets within Europe, and rising budgets—and tensions—in parts of Asia, mean there is a new imperative for EU member states and EU-based companies to target the region for sales. Indeed, EU-based suppliers have also shown a growing willingness to offer generous technology transfer agreements in order to conclude deals. This policy brief from the European Council on Foreign Relations (ECFR) seeks to give an account of these trends to better understand the impact of EU member states on the Asian military balance.